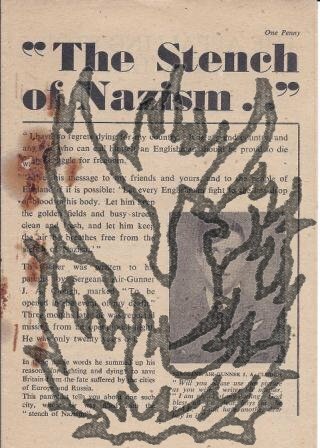 [Second World War pamphlet in support of the Conservative and Unionist Party.] Politics in War Time. What the Opposition Leaders are Working for To-day. 4pp., 12mo. Bifolium. In fair condition, on lightly aged and worn paper. 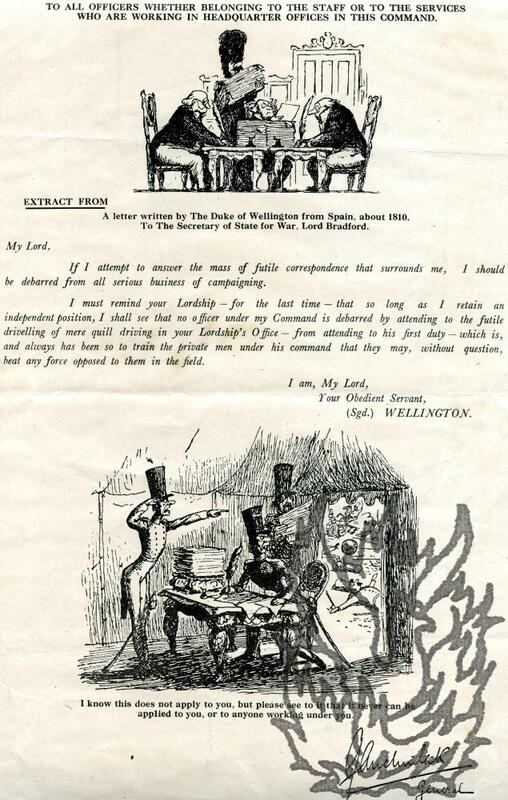 An interesting survival (no copies traced on either COPAC or OCLC WorldCat), indicating that British party politics was not entirely suspended during the 'Phoney War'. The pamphlet gives no indication that it is directly issued by the Conservative and Unionist Party, but see the quotation from Chamberlain below. The front cover reads: 'Politics in War Time. [Pamphlet] A Glimpse into America's Past An English version of the documents, speeches and stories appearing in the Chinese magazine 'America Today' July 4, 1951. Pamphlet, pp, 12mo, white printed wraps, stapled (sl. rusty), partially unopened, minor damage and staining. Includes the text of "The Star-Spangled Banner" and part of the Gettysburg Address" and similarly uplifting material, putting the US in a favourable light. No copy listed on OCLC/COPAC. [Printed pamphlet.] Information & News Sheet published by British Prisoners of War Funds (British Prisoners of War Books & Games Fund and Forget-Me-Not League Registered under the War Charities Act, 1940) No. 18 - Far East. Carrington House, Hertford Street, London W1. 11pp., 12mo. Fair, on aged and creased paper. 'Please return' in manuscript at head of first page. Newspaper cutting titled 'Prisoners in Japanese Hands' loosely inserted. Begins with a section of 'Parliamentary News concerning Prisoners of War in the Far East. '; then 'Report from U.S.A.'; and a final 'Extract from copy of broadcast by Major Gourlay from Thailand', with a couple of manuscript interpolations. Scarce: no copies on COPAC or WorldCat. 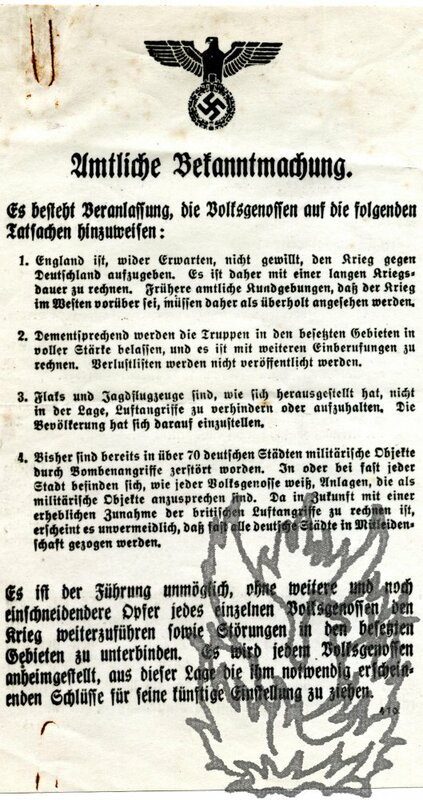 [British anti-German Second World War propaganda pamphlet, printing the transcript of a BBC broadcast.] The Woman from Poland. 4pp., 12mo. Bifolium. In fair condition, lightly-aged and creased. Beneath the cover on the front page are four quotations: 'I don't know what astonishes me most about you British - your kindness and your courage, or your blindness. '; 'Not one in ten of you knows what a German victory would mean to you. '; 'Wake up. 12mo, 8 pp. Staining and slight damage to first leaf from rust from staples, otherwise good on aged paper. (Two words of text are lacking, but easily supplied in the following: 'to die the struggle' and ve this message to my friends'). Slug carries code 'CP/C/29/4/43. ', the last three elements indicating the date of publication. The front page carries a photograph of Clough, a twenty year-old 'reported missing from an operational flight', and reproduces a letter left by him for his parents. 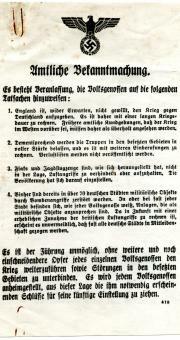 Part of a mimeographed typewritten report into the activities of the VDA, including translations of Haushofer's 'Problems and Solutions of the VDA', Bockhacker's 'Resettlement Christmas', and other texts. [Compiled by the American intelligence services between 1942 and the end of the Second World War. The spelling (e.g. 'honor') is American, the latest date mentioned is in 1942, and there is no indication that the document has ever been published. 58 pages, on one side each of fifty-eight A4 leaves (each roughly 26 x 20 cm), paginated 26 to 83. Punch holes for a binder at the head of each leaf. 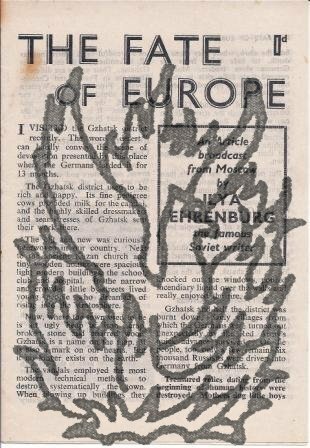 Seven original aerial propaganda leaflets dropped by Bomber Command (six over Germany; one over France), 1939-1945; with copies of a further two (in German). All nine items with accompanying contemporary typewritten translations by W. A. Green. 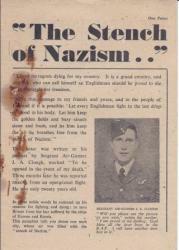 Seven scarce examples of English Second World War propaganda, six aimed at Germany and the last at France. Ephemeral and scarce. The seven are clear and complete, on lightly-aged paper with occasional minor rust spotting. Each consists of two pages printed on a leaf 21 x 13.5 cm, except for Five, the dimensions of which are 21 x 13 cm. Five (red and black) is the only item not printed simply in black and white. All seven in German, except Seven, which is in French. All translations in typescript and on A4 leaves. Printed circular letter from Auchinleck 'To all officers whether belonging to the Staff or to the Services who are working in Headquarter Offices in this Command'. 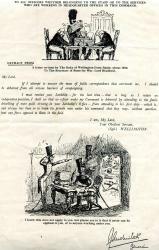 Consisting of a celebrated (and spurious) quotation from Wellington, and two cartoons. 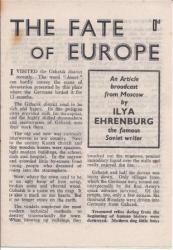 A celebrated and scarce piece of Second World War ephemera. Printed on one side of a piece of paper 33.5 x 21.5 cm. Text and illustrations clear and complete. In good overall condition, on lightly-aged and creased paper with small damp stain to top left-hand corner and repair on reverse to small closed tear. 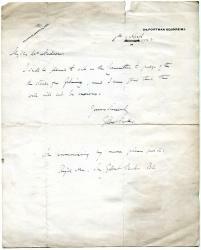 The text consists of a supposed 'Extract from a letter written by The Duke of Wellington from Spain, about 1810. 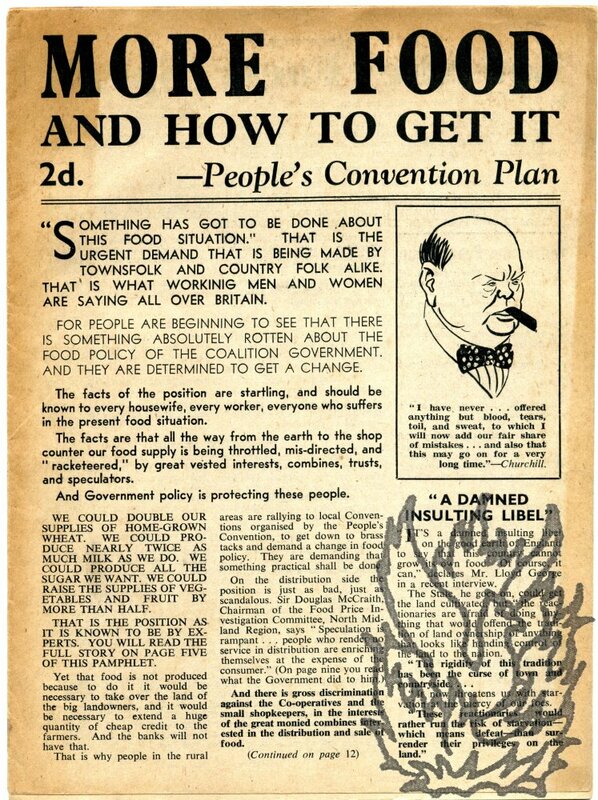 Pamphlet titled 'More Food And How To Get It - People's Convention Plan'. 12 pp. Complete and clear, on browned high-acidity paper. According to one authority 'The People's Convention (P.C.) 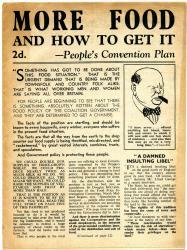 began life as the People's Vigilance Committee, set up by the Hammersmith Labour Party and Trades Council in July 1940. The leading figure was Denis Noel Pritt, a recently expelled Labour M.P., but the aims were very much in line with the policies of the Communist Party (C.P.) in that period of the Phoney War.' The Convention met in January 1941 and folded at the end of the year. Fabian Society. Syllabus of a Series of Lectures to be given at Essex Hall, Essex St., Strand, London, on alternate Fridays, January to April, 1926, at 8 p.m.
4to: 4 pp. Unbound bifolium. On lightly discoloured and spotted paper, lightly worn at extremities. Central horizontal fold. Gives details of eight lectures, by, successively, H. Finer ('Impressions of America'), Montague Fordham ('The Rural Problem'), R. B. Forrester ('Co-operative Marketing'), Professor R. Peers ('Can we educate the Community? '), Arthur Greenwood, M.P. ('The Present Position and Future Policy in regard to Housing'), C. S. Orwin ('Land Tenure'), Rt. Hon. [sic] Sidney Webb, M.P. ('Poor-Law Reform'), and (with the 'syllabus' covering an entire page) H. St. J. B.
Autograph Letter Signed, Autograph Note, and newspaper article. 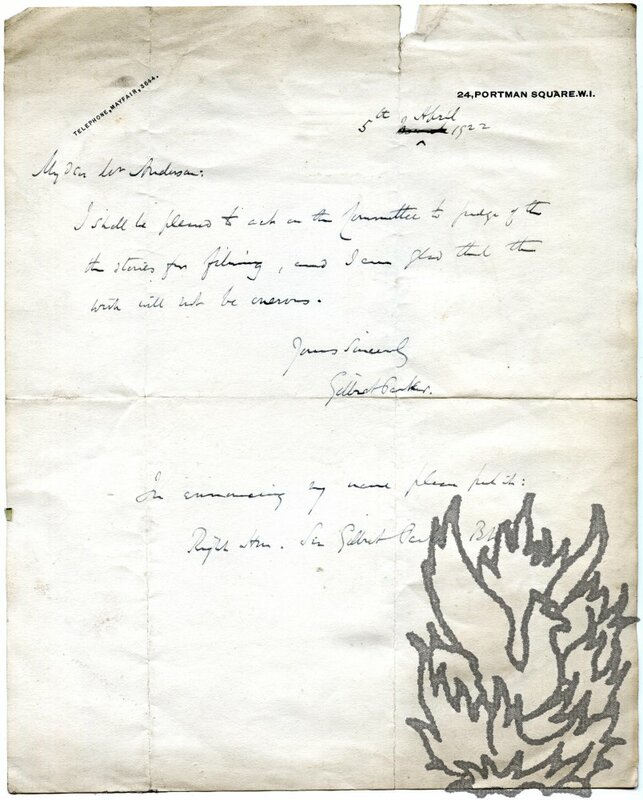 The note 10 January 1918 and the letter 14 January 1918; both on letterheads of Heming & Co., 28 Conduit St.
Mayor of Westminster (1858-1938), and prominent member of the Goldsmiths' Company, for whom he established an annual competition for craftsmen and schools in London. All items very good. Both manuscript items bearing the Society's stamp and the note also docketed. THE LETTER (one page, 12mo): 'I shall certainly try to be at the meeting on Feby 27th & will speak if opportunity arises - also will call upon you someday either this or next week.' Signed 'G. Booth Heming'. THE NOTE (one page, 12mo): 'With G.